Th-INK-ing of You: Welcome to the August ODBD release! Hello friends! Welcome to the August ODBD release! This month we are celebrating all things sports! It's a big release, and there's something for almost everyone! I hope you have had a chance to see the release, but if not you can see it HERE. For my card above, I used the ODBD Center Step card set and the ODBD Old Glory paper pack to decorate the fancy fold. 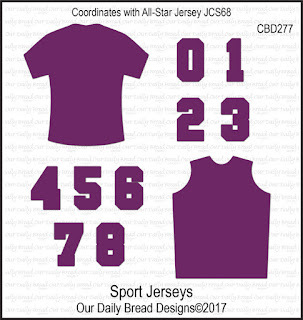 I used the new Football Stamp/Die Duo set, as well as the All Star Jersey set, and I used the Football die that comes with the Football set, and the Sports Jerseys Dies that coordinates with the All Star Jersey set. I also used past releases: Double Stitched Rectangles dies, Double Stitched Pennant Flags Dies, and the Sparkling Stars dies for the little star on my twine bow. 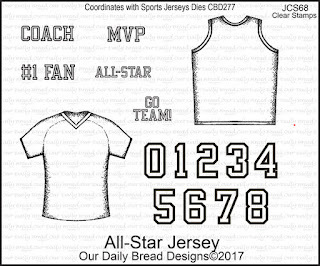 I stamped the jersey twice, one on white and once on a blue paper from the Old Glory pack. I stamped the shirt's sentiment on the white shirt, and I then paper pieced the white over the blue after cutting out the pieces I wanted to leave blue. I stamped the footballs and die cut them with the included die, then I colored them with Copics. I stamped the verse on white card stock and cut with the Pennant Flag die and layered that on my rectangle die cuts. I "hung" the pennant from some twine which I topped with a tiny red star. This was a fun card to make! 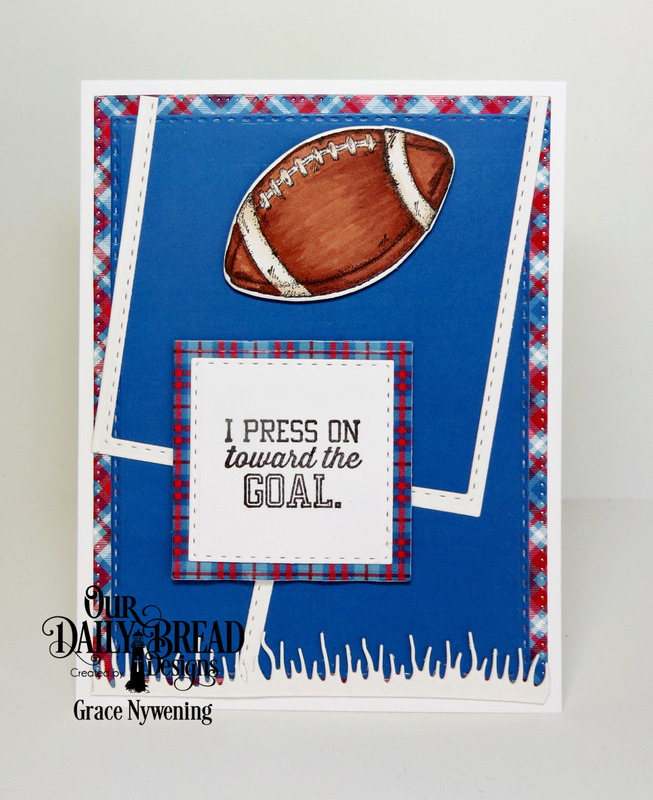 For my second card, I again used the Football Stamp/Die Duo set, and the Old Glory Paper Pack. I stamped my sentiment and cut with a Double Stitched Square die, and matted that with a regular Squares die cut from the design paper. 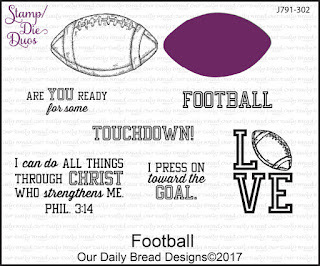 I used the football set to stamp the football, and colored with Copics, then die cut with the included die. For my hand made goal, I used a Double Stitched Rectangle and a regular Rectangles die to cut a frame, and cut off the parts I did not need. I finished off with a Grass Lawn die, cut from white. While this is rather CAS, really it has enough layers to be interesting and yet is still quick and easy to put together. These are fantastic!! I really like the goal post on the one card. too cute! Wonderful cards. Love the scripture and sentiment that you used. Such lovely cards!! I love the verse on the first card. It's one of my favorites! Your cards are so creative, Grace!! I especially love your scripture on the centerfold with the footballs and T-shirt!! Beautiful work! Your goal on the second card is so creative!! TTYS! Fabulous card & a fabulous release! Oh, wow, this is fabulous Grace! LOVE your cards~they are so creative. Always, Grace, your creativity is top-notch and so very inspirational! Fabulous Cards Grace. I love the inspirational sayings you've used on these cards...and so appropriate for many occasions. Great work. Lovely cards grace have a blessed day. Beautiful cards everyone, I don't always get around to commenting, your inspiration is amazing giving me ideas for my own crafting. Great samples, Grace! Love the center step and how CLEVER making a goal post!! Grace these are so great! I love the step card and I really love how you did the goalpost on the second card! You are so smart! What an ingenious way to make goal posts! Fabulous cards. Love the way you colored those pigskins! Thanks for sharing. Ever so talented and very creative, Grace! Love the center step card, but the goal post on the football card is so clever! You scored big time on these wonderful two cards! Hugs! Great masculine cards, Grace! Clever way to use the dies, wonderful showcasing of the ODBD products! Hi Grace! I really enjoy how you brought the scripture into an everyday world! Great designs, both of them. Grace, what wonderful masculine cards, and I really love how clever you made the center-step card and added this precious Scripture. Beautiful colors and coloring! And wow, I love how you've made your own goal posts and have the football flying through it with the Scripture portion. Very clever and a wonderful card to encourage a young man who loves the Lord. Wonderfully done, sweet friend! Miss you lots and sending hugs and love! I know I comment on BC but I sometimes forget to visit your blog to tell you how much I enjoy seeing your creations! Your cards are so awesome and the goal post cards is so cool!